4. US nuclear security budget- less for disarmament! UN Secretary-General Ban Ki-moon will address the 3rd World Conference of Speakers of Parliament being convened by the Inter-Parliamentary Union at the Palais des Nations (United Nations) in Geneva from 19-21 July. This summit of parliamentary speakers will focus on democracy, the role of legislative institutions and their relationship with the United Nations. Representatives of UN agencies and Permanent Representatives of UN member States will participate as observers. Recommended action: PNND members could contact their Speaker of Parliament to request him/her to speak at the Speakers’ Conference in support of Ban Ki-moon’s Five-Point Plan and encouraging governments to implement the agreements they reached at the NPT Review Conference. Countdown to Zero, a powerful documentary produced by the same people who brought us An Inconvenient Truth, will be launched in United States theatres on July 23 and 30. The movie traces the history of the atomic bomb from its origins to the present state of global affairs, with the world held in a delicate nuclear balance that could be shattered by an act of terrorism, failed diplomacy, or a simple accident. The film features an array of international statesmen, including Jimmy Carter, Mikhail Gorbachev, Pervez Musharraf and Tony Blair. Promotion of the film includes film screenings and launch events, information on how to volunteer, plus links to key organisations campaigning for nuclear abolition. A special pre-launch screening of the movie will be held for the Speakers of the World’s Parliaments and UN Ambassadors in Geneva on 20 July, Palais des Nations, Conference Room XIX at 1:15 pm. On 25 July, PNND’s parent organization, the Global Security Institute, will host a free screening of the movie, followed by a Q&A session in the key swing state of Maine. Support from Maine Republican Senators Snowe and Collins is considered vital for Senate ratification of START and the CTBT and other elements of President Obama’s Prague agenda. On 26 February, UN Secretary-General Ban Ki-moon sent a letter to the Speakers of all parliaments noting the importance of the nuclear Non-Proliferation Treaty Review Conference, highlighting the important role of parliaments and parliamentarians in advancing nuclear disarmament, informing them of his Five-Point Plan for Nuclear Disarmament and commending PNND and IPU for their efforts in engaging parliamentarians in these issues. 4. US nuclear security budget – less for disarmament! According to Nuclear Security Spending: Assessing Costs, Examining Priorities, a book by Stephen Schwartz and Deepti Choubey (Carnegie Endowment for International Peace, 2009) the United States spent over $52 billion on nuclear weapons and related programs in fiscal year 2008, but only 10 percent of that went toward preventing a nuclear attack through slowing and reversing the proliferation of nuclear weapons and technology. Nearly 60% was spent on operating, maintaining and upgrading the US nuclear arsenal. In February 2010, US President Obama requested an increase in funding for the US nuclear weapons complex (See Obama budget seeks 13.4 percent increase for National Nuclear Security Administration, Washington Post, 3 February 2010). Some analysts speculated that the requested increase was made in order to secure support from Republicans for ratification of the START follow-on treaty. However, the request met with resistance from some Congress members who believed that the US should be placing a higher priority on non-proliferation and disarmament than on maintaining and modernizing the nuclear stockpile. PNND Co-President Ed Markey and a number of other Congress members sent a letter to the House Appropriations Sub-committee criticizing specific aspects of the funding request, including the increase in funding requested for the production of plutonium pits and uranium processing that could be used to manufacture new nuclear warheads, and the decrease in funding requested for warhead dismantlement. Markey and the co-authors argued that the government should prioritise funding for warhead dismantlement and stockpile reduction to support multilateral disarmament, rather than the modernization and production of warheads which are a stimulus to proliferation. On June 2, 2010, the Senate of Canada unanimously adopted a motion submitted by Senator Hugh Segal (Conservative Party), which, inter alia, endorsed the UN Secretary-General’s Five-Point Plan for nuclear disarmament and encouraged the government of Canada to engage in negotiations for a Nuclear Weapons Convention. While Senate resolutions are usually just declaratory, in this case, the Senate decided to send the motion to the House of Commons with the aim to achieve a common resolution following the summer recess. The overwhelming support by the Senate for the Nuclear Weapons Convention follows the release in March of a letter supporting the Nuclear Weapons Convention from over 500 recipients of the Order of Canada – the country’s highest civilian honour. PNND Special Representative Roméo Dallaire, speaking in the debate on the draft resolution, indicated a number of key areas in which Canada could contribute to nuclear disarmament – including verification for a NWC and the establishment of an Arctic Nuclear Weapon-Free Zone as a step towards global nuclear abolition. Norwegian Foreign Minister Jonas Gahr Store on 24 June announced that NATO’s new Strategic Concept should “stress the importance of eliminating nuclear weapons.” (See Norway Demands Anti-Nuclear NATO Strategy, Global Security Newswire, 24 June). Store’s comments were in response to a report released by the NATO Strategic Concept Expert Group, chaired by former US Secretary of State Madeleine Albright which according to Norwegian officials "has not mentioned disarmament." On the contrary, the report noted that "It's very clear that NATO continues to rely on conventional and nuclear weapons; that is part of the deterrent posture." Mr Kidd has written to the UK Defence Secretary seeking safety assurances in view of the possibility of a nuclear accident at Faslane, in close proximity to Glasgow, Scotland’s largest urban area. Mr Kidd has also written to Dr Mike Weightman, Director of the Health and Safety Executive Nuclear Safety Directorate, asking for an urgent meeting to discuss the matter in detail. On 22 June, four prominent political and diplomatic veterans in Seoul jointly expressed support for the international effort to curb the use of nuclear weapons and achieve a nuclear weapon-free world. The move follows a series of similar joint declarations made by political heavyweights in countries like the United States, UK, Germany, Italy, Netherlands, Norway and France. In Korea, the four veterans were former Prime Minister Lee Hong-koo, former Foreign Minister Han Sung-joo, former National Assembly Speaker Park Kwan-yong and former Army chief of staff, Paik Sun-yup. In a “Statement on a world free of nuclear weapons,” the four elder statesmen urged the US and Russia, the states with the largest nuclear arsenals, to “continue to accelerate substantial arms reduction,” and asked other nuclear states to join reduction negotiations. They also supported the Comprehensive Test-Ban Treaty and urged North Korea to return to the nuclear Non-Proliferation Treaty (See Cut nuclear weapons, ‘four wise men’ urge, JoongAng Daily, 23 June). In a similar high-level statement, former South Korean President Kim Young Sam (the first civilian president of South Korea), former head of the International Atomic Energy Agency Mohammed ElBaradei and former South Korean Prime Ministers Dr Nam Duck Woo and Lee Hong-Koo called for a range of nuclear disarmament measures including a preparatory process to achieve a Nuclear Weapons Convention or framework of agreements. On 14 June, PNND and the Peace Boat adopted a Memorandum of Collaboration (MoC) outlining ways the two organizations plan to work together in advancing the common goal of building a safer and more peaceful world, in particular by acting to prevent nuclear non-proliferation and promote nuclear disarmament. Peace Boat was established in 1983 by a group of Japanese university students as a response to government censorship regarding Japan’s past military aggression in the Asia-Pacific. The students chartered a ship to visit neighboring countries with the aim of learning first-hand about the war from those who experienced it and initiating people-to-people exchange. Peace Boat now organises three annual global voyages, with approximately 800 passengers each time, visiting port cities to educate about peace, human rights, the environment and development. The other co-founding members of the group are Mr. Jaan Kundla (independent MP), Mr. Lauri Luik (Estonian Reform Party faction), Mr. Erki Nool (Pro Patria and Res Publica Union faction), Mr. Nikolai Põdramägi (Estonian Centre Party faction), Mr. Indrek Saar (Social Democratic Party faction) and Mr. Jaak Salumets (Estonian Reform Party faction). The group was established following a visit to Estonia by PNND Global Coordinator Alyn Ware. On April 28, at the Civil Society Forum of Nuclear Weapon-Free Zones held at the United Nations in New York, PNND member Hideo Hiraoka released a Joint Statement by Parliamentarians of Japan and the Republic of Korea (RoK) on Denuclearization of Northeast Asia. The statement was endorsed by 86 Japanese parliamentarians from 7 political parties and independents, and 7 South Korean parliamentarians from 3 political parties. The statement was organized by the joint efforts of PNND Japan and PNND RoK. The statement says “We recognize that a Northeast Asia Nuclear Weapon-Free Zone initiative will be effective for achieving the denuclearization of the region... we call on the Governments of Japan and the RoK to advocate the establishment of a Northeast Asia Nuclear Weapon-Free Zone in the international fora, including the NPT Review Conference and the UN General Assembly.” The statement also notes that recent developments, including initiatives of US President Barack Obama and UN Secretary-General Ban Ki-Moon, have opened a window of opportunity for achieving the denuclearization of Northeast Asia through a NWFZ. 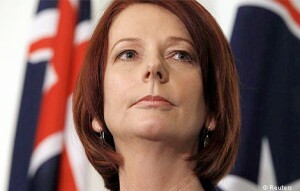 On 24 June, PNND member Julia Gillard was sworn in as the first female Prime Minister of Australia. She had previously served as Deputy Prime Minister, Minister for Education, Minister for Employment and Workplace Relations, and Minister for Social Inclusion. Ms Gillard has been active in PNND for a number of years supporting initiatives such as the Parliamentary Statement on Nuclear Testing. PNND sent a congratulatory letter to Ms Gillard on 5 July signed by the seven PNND Co-Presidents along with the PNND Honorary Member (Helen Clark), PNND UN Liaison (Dennis Kucinich) and Chairs of our key program partners the Middle Powers Initiative, Global Security Institute and Bipartisan Security Group. (See also PNND Members in leadership positions worldwide). On 23 June, PNND and the Fredrich Ebert Stiftung hosted a roundtable of parliamentarians and disarmament experts in the European Parliament to discuss the role of parliamentarians to advance the agreement of the 2010 NPT Review Conference and to impact on the NATO Strategic Concept. The roundtable was co-chaired by European Parliament Members Frieda Brepoels, Annemie Neyts and Anna Maria Gomes. Guest speakers included Randy Rydell (United Nations Office of Disarmament), Dirk van der Maelen MP (Belgium) and Alyn Ware (PNND Global Coordinator) – with a presentation in absentia from Carlos Vargas (Senior Legal Adviser in the Costa Rican Ministry of Foreign Affairs). Key themes included a) the new opportunities arising from the 2010 NPT Review Conference and the US Nuclear Posture Review for parliamentarians and governments to advance the UN Secretary-General’s plan for nuclear disarmament including the Nuclear Weapons Convention; b) the need to work collaboratively in Europe to reduce the reliance on nuclear weapons in order to ensure the new NATO Strategic Concept supports nuclear disarmament, and c) the value of Members of the European Parliament liaising with members of national parliaments in Europe to implement key resolutions on nuclear non-proliferation and disarmament. PNND also used the occasion to announce that Frieda Brepoels and Annemie Neyts would serve as Co-Chairs of the PNND European Parliament Section for the current parliament, and Ana Gomes would serve as a Deputy-Chair. The UN Office of Disarmament Affairs produces an internal Disarmament Digest every few days with summaries and links to key news-stories about nuclear non-proliferation, disarmament, the arms trade, military expenditure and related issues. As a partner with the UN, PNND has access to this digest for our members (but not for public distribution). Please contact us if you are interested in receiving the digest on a trial basis (there is no charge).